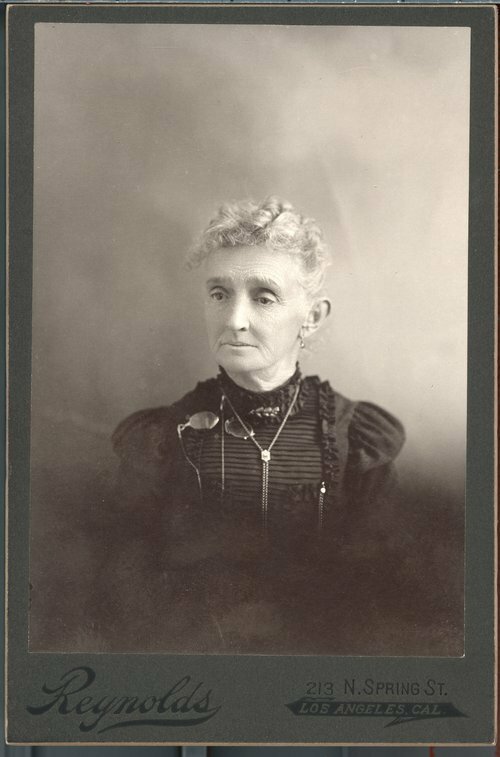 This cabinet card shows Susan J. Clapp Searl, ( 1833-1914), wife of Albert Dwight Searl. The couple married on October 9, 1857 in Southhampton, Massachusetts. Later moved to Lawrence, Kansas for Albert to establish his surveying career. In 1861, when he enlisted as a private in the Eighth Kansas Volunteers, Susan accompanied him into battle for nearly a year attending to the sick and wounded soldiers at battlefield sites. As the Civil War continued and her husband moved up the military ranks, Susan decided to return to Lawrence. In the closing days of the war, the couple were reunited and remained in Douglas County until Albert's career took them to Leadville, Colorado in 1872. Susan died at the age of eighty-one and was buried in Oak Hill Cemetery in Lawrence, Kansas.